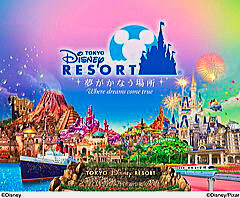 Tokyo Disney Resort Fixed Dated 1Day Passport is for either Tokyo Disneyland or Tokyo DisneySea. The Admission includes park entry and use of all attractions in the park. After exchanging the E-ticket to actual TDR passport at Maihama Station, you are allowed direct enty to the park. Please present your valid Passport and the E-ticket to the staff at Maihama Station North Entrance in order to receive actual TDR passport. The park entrance is about 3 mins walk from the station. *If you can not exchange your E-ticket to the TDR passport between 08:30am and 13:00pm(Japanese time) on your visiting day, the tour guide treat it as you have given up the product and no cancellation or amendment can be applied. *Please proceed if your departure date for Japan is more than 5 business days from the booking date. *Please contact us if your departure date is within 5 business days from the booking date.